Wino stunt doubles Jordan and Jason attended the event armed with notepad, pen, camera, and umbrella. First stop: friend of the Winos Larry Schaffer, pouring for Fess Parker. We love Larry, but Jason had ulterior motives — he was looking for a place to stash his umbrella and secretly hoping Larry brought along some of his killer Rhone blends. 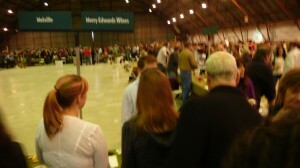 No such luck, but he was serving up a long list of Santa Barbara Pinots from Fess. The 2007 Ashley’s Vineyard was smooth, well balanced, and bright, while the Clone 115 was full of body and much darker on the palate. In typical fashion, Larry brought along some barrel samples of soon-to-be-released ’08 Pinots. The ’08 Ashley’s was extremely well balanced, and the ’08 Bien Nacido screamed “big!” Alas, Larry was so swamped with customers we hardly had time to chat. Catch you next time! 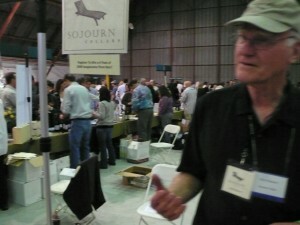 Along the way, Jordan caught sight of one of his favorite producers, Sojourn Cellars from Sonoma Coast. 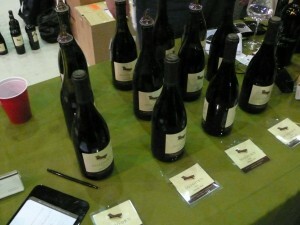 Sojourn is a small producer, offering only four Pinots and three Cabs. 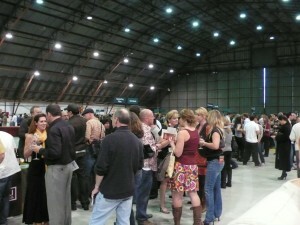 They came with their four highly regarded 2008 Pinots: Gap’s Crown, Sangiacomo, Rodgers Creek, and Sonoma Coast. All were supremely drinkable with bright fruit, firm acidity, and excellent balance. Lovely drink-now Pinots! 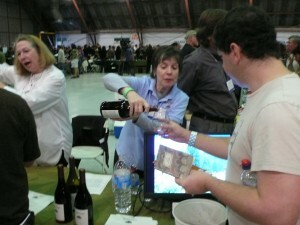 Upon arrival, Lisa pointed us to some of her favorite under-the-radar pinots in the room. Her suggestions didn’t disappoint! 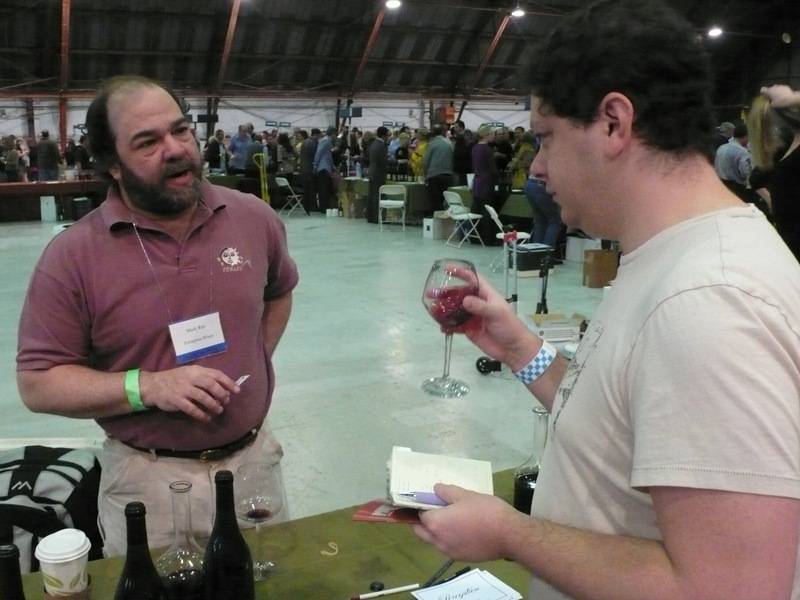 Fred Scherrer from Scherrer Winery in Alexander Valley had two pinots on hand, 2006 Sonoma Coast and Russian River Valley. The Sonoma Coast had some huge fruit on the palate with exceptional smoothness and a tart, tannic finish. The vintage from Russian River Valley was more subtle in flavor (Jason tasted currant) but provided more structure with bigger acid. Perception Wines, another Sonoma producer from Russian River Valley, offered their 2007 Russian River Pinot and 2007 Orsi Vineyard Pinot. The former was surprisingly sweet and round, “like a pillow,” offered Jordan, and the Orsi had the most floral nose Jason detected all day. Not bad for $40-50 a bottle. 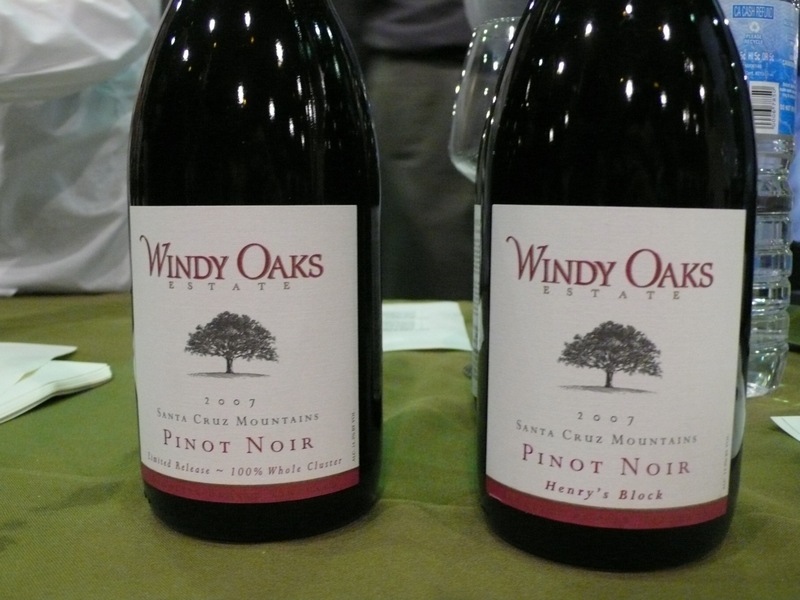 Windy Oaks Estate hails from a bit further south in the Santa Cruz Mountains. All their wines use only estate grown grapes, and they strive for a Burgundian style in their wines (Pinot Noir and Chardonnay). 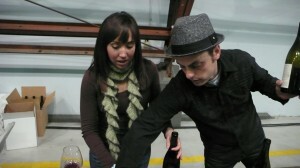 Jordan and Jason tried two of these French-inspired Pinots. The 2007 Henry’s Block had about as much territorial specificity as possible, derived from a single acre of vineyard! This big, chocolatey, rich taste really hit the spot. The 2007 Whole Cluster Pinot was equally big, juicy, and chocolatey. “Whole cluster” refers to the process of making the wine — instead of de-stemming and crushing the grapes first, whole cluster wines are fermented straight off the vine, stems and all intact. In this case, less really is more! 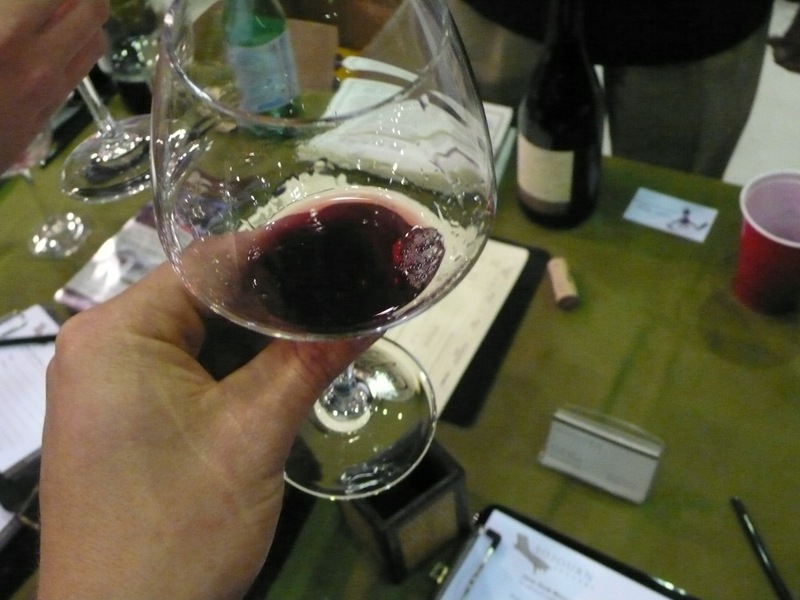 For a fun interlude, we tried Clos Pepe’s 2009 Rosé of Pinot. This was intense! 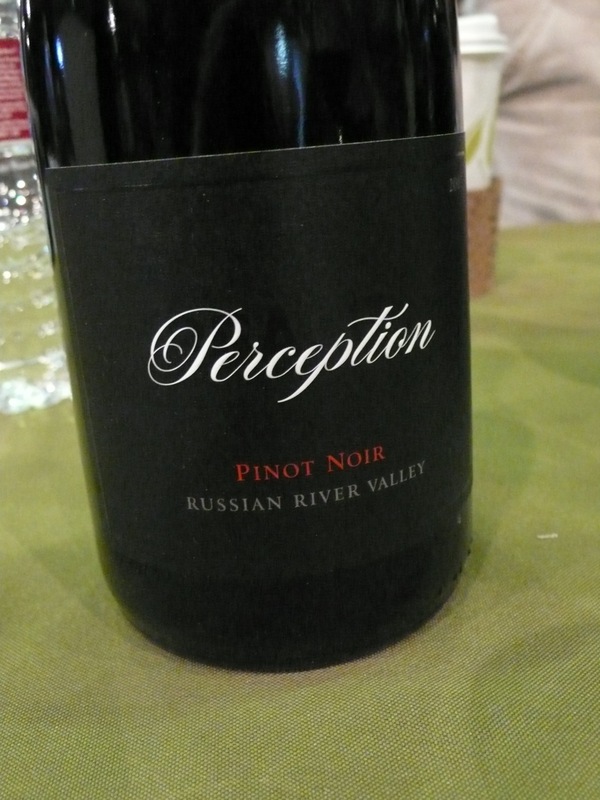 Floral nose, nice tart palate, and a beautiful “princess pink” color. Yummy rose that provided a much-needed break from the onslaught of pinots in the room. At a certain point, taking notes gets harder for even the most experienced Wino. 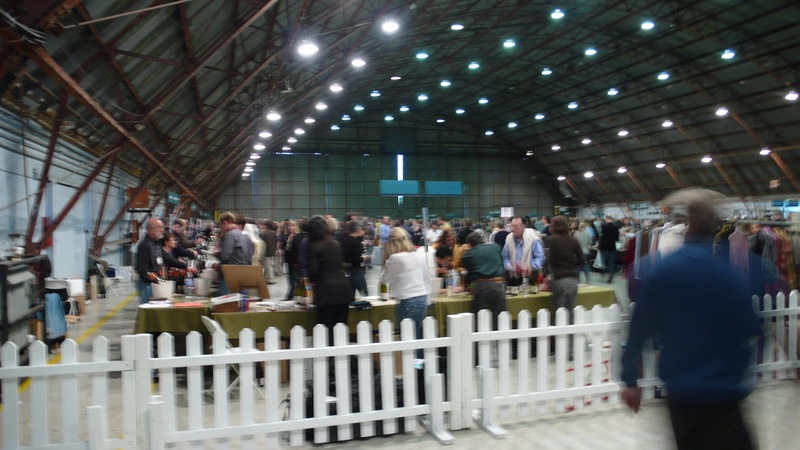 Out of the 75 producers, we hit up 5 more and enjoyed them all. Paraiso Vineyard from Monterrey served up some SIP certified wines, which means that they are sustainably produced — good for the environment and the palate. Two others from Sonoma we enjoyed were Merry Edwards and J Vineyard, the latter of which is better know for its sparkling wines. 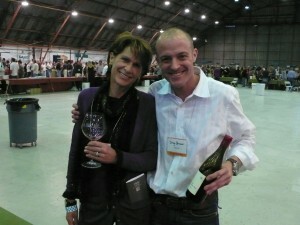 Finally, returning to Santa Barbara, we finished off our grand tour of California Pinot with Melville and Ken Brown.